OK, a cocktail party on a weeknight. No time to go home and change after work. Does this dress look good for work and the party? The one I got is not identical but close enough. Dressier with a big chunky necklace like the model is wearing, or long stands of gold to cut the black dress a bit? What do you think? Not to be one of those complainers, but this is what I feel like, and why I have been silent for almost two weeks! It’s hard to write when you are starting a new job. I am so zapped at night and barely have time to even read my fave blogs! Where am I going to find more time? I also blame my numerous trips to NYC for eating up the weekends. But they have been so fun, I can’t be mad at them. I hope to be back this weekend as I have zero plans. Also, I don’t know why I googled messy room just now — that’s totally the first thought that came to mind when I contemplated my lack of blogging. 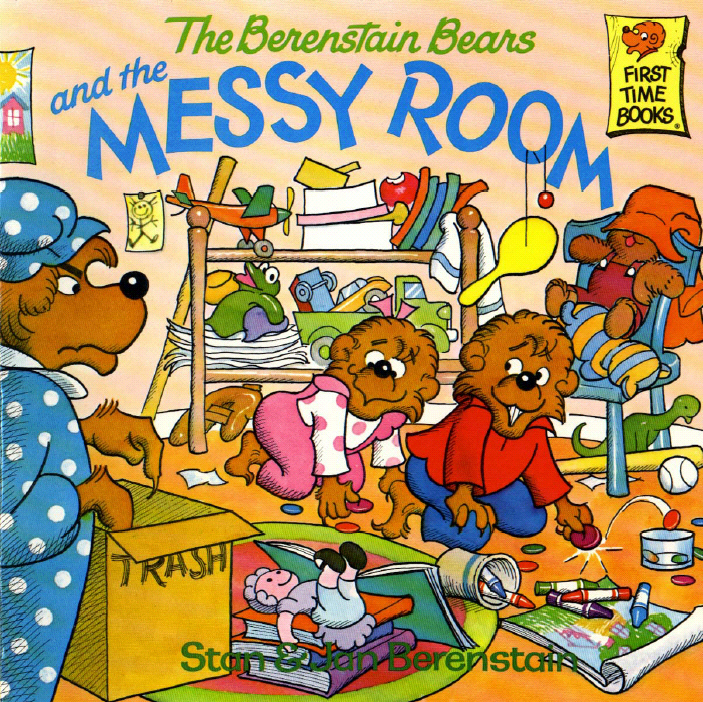 I also stumbled across the Berenstain Bears “Messy Room” book. I loved those books! Didn't you love these books? Ha! She’s right. But I’ve been feeling a need for comfort food these days! Pizza tonight (oh yeah and the mint milano cookies I rediscovered and have become obsessed with)! I’ll be more wholesome next week! Hot dogs are really an under-appreciated food! Why do they have such a bad rep? Are they that bad for you? I don’t even care anymore. I had a delicious hot dog at Ted’s in Buffalo this weekend. Grilled over charcoal…delicious! I usually only eat a hot dog at a baseball game, but I enjoyed it almost as much, right there, in the restaurant. Good thing we don’t have a grill, or it would be hot dogs every night! I’m not sure why Ted’s calls them “red hots”, but if I go back on the next trip, I am getting a jumbo instead of a regular. Now I’m starving again. I need to go to a Nats game or to Ben’s asap What’s better: a hot dog and a beer or a hot dog and a milkshake…? Yes, that’s Bacon used as a verb. And yes, I kinda love that Dairy Queen commercial. Can you find it online? It makes me laugh every time and I can’t find it anywhere. In my searching though I discovered a huge fan base for DQ commercials! They also have a blog, a blizzard tour, a facebook page…pretty funny! I did a bacon search on Flickr also and found this amazing looking sandwich! For Mother’s Day this year, my sister and I were going to send a flower arrangement to mom, but when it came down to it, we couldn’t remember which flowers make her sneeze…so we sent an edible arrangement instead!! 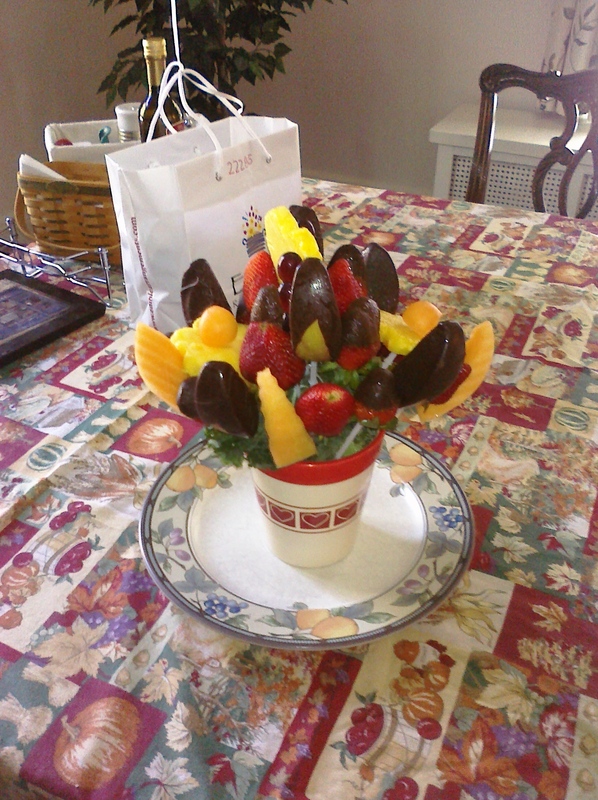 I have been torn recently by the edible arrangement…I’m sort of drawn to it, but also not sure if it’s really lame. Well, now I am a fan! The picture my mom sent makes it look tasty, it’s something different to receive, it’s kind of funny, and according to mom it tasted pretty fresh! Mom even sent the picture! 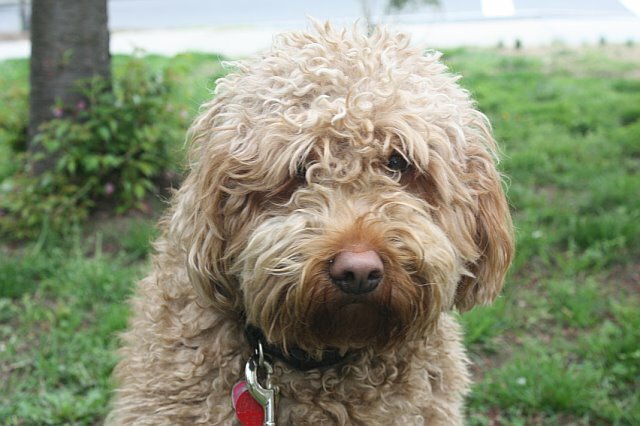 Here’s a shot of Artie this week – he’s getting a big summer haircut on Saturday. Say toodles to the curls! I may not be able to post the after shot for a few days. He always looks so different after the summer cut – I have to let it get a little messy! I am about to start my roast pork loin with figs! It’s just me and MJD eating – with artie drooling – but I am excited to try a new recipe! We got back from the Episcopal Church in Dupont a little while ago. It was our first time there and it was a great service. It’s nice to go to a service on the holidays – I feel good about that. Do you have a favorite church in town? I really loved how this one was so welcoming – and there was a lot of singing. 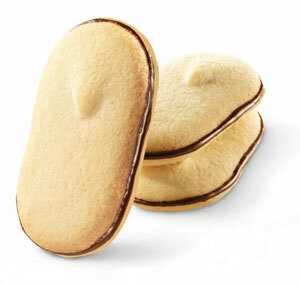 Oh, and all the kids in their Easter outfits – so sweet! Alright, I have to get to the kitchen. I was also going to make brownies, since we didn’t get home for easter baskets, but we’re trying to be healthy. So, low fat ice cream it is! Alas, it’s still a great day! Btw, the weather is amazing this weekend! We went to Great Falls yesterday for the first time…pictures coming.